Don't finish your next workout with the same old set of curls. If you're looking for a simple way to burn fat, add muscle, and boost your strength, just pick up the nearest heavy object and take a walk! Spoiler alert: I'm not presenting a novel exercise here. In fact, this exercise has been around as long as we humans have walked this earth. In the past, it was the most effective way of getting children, food, and supplies from point A to point B. Today, strength coaches around the industry swear it's the best way to make tough, gritty athletes out of mere lifters. Depending on how you do it, it can fit seamlessly in either a muscle-building or fat-loss program. The best part is that it requires next to no coaching, and you can start in any gym right now. I'm going to ask you to do two things to transform your physique: Pick something up, and start walking. If you can do this, you can accelerate your progress. Meet the weighted carry! Yes, I said the weighted carry is as simple as picking something up and walking, but of course there are ways to do it wrong. Follow these technique musts to ensure you're safely and properly executing the exercise. With a straight back and tight core, deadlift your weight or weights off the floor to a standing position. Just because you're not doing deadlifts for reps here doesn't mean you can slack on form. If you're holding the weights at your sides, don't let the weights sag into your fingertips. Grip it like you mean it. Think about trying to crush the weight with your hands. For every variation, be sure to keep your shoulders packed as you walk. Think about keeping a tall chest, slightly pinching your shoulder blades together, and keeping your eyes forward the entire time. Many people are surprised how much they "feel it" in their upper backs after performing carries. As you walk, keep tension throughout your core by bracing. Think of the tension created when you cough, and recreate it during the carry. Take short and powerful breaths into your belly (not your chest), and keep tight. Weighted carries can be done with a variety of items. Find something to pick up, and start walking! What muscles does the weighted carry work? Pretty much all of them. A properly executed weighted carry works your body head to toe, but specifically, the postural muscles of the upper back—think traps, rhomboids, and lats—plus forearms, grip strength, and your core. Depending on which variety you choose and if you perform it bilaterally (two arms) or unilaterally (one arm), you'll also hit some muscles preferentially. Don't make the mistake of thinking that unilateral variations are any easier, either. Your obliques will tell you exactly why not. This is the most basic of weighted carries, but also my favorite. Use a pair of dumbbells, kettlebells, or a trap bar, and deadlift the weight off the ground. Then walk. Only walk as far as you can with impeccable form—shoulders back, eyes forward, crushing your grip, and keeping your core tight. Don't be shy. Challenge yourself and go heavy. As a goal, work up to doing farmer's walks with 50 percent of your body weight in each hand. It's OK to go even higher. Take a single dumbbell, plate, or kettlebell, press or push-press it overhead, and walk. Follow the same basic form tips during this specific variation, and keep your shoulders square rather than leaning or tilting to compensate for the weight. Once again, walk as far as you can with impeccable form. Because you only have weight in one hand, you'll have to utilize your core to an even greater extent to stabilize the weight overhead and yourself as you move. Remember to switch sides to give the other arm equal attention. These are fantastic for improving your shoulder mobility and overhead position for presses, by the way. This is best done with odd objects like sandbags, punching bags, stones, and even bags of salt. In a commercial gym, you could hold a barbell in the crooks of your arms, similar to a Zercher squat, or a pair of kettlebells in a front-racked position. No matter what you choose, hug it tightly in front of you, and walk as long as you can. The more awkward the weight, the tougher these get—in a good way. Just don't expect breathing to be easy. Keep from leaning back to support the weight. Stand straight and tall, and think about trying to touch the top of your head to the ceiling. Want to get stronger? Pick up really heavy things and walk. Working on building muscle? Pick up heavy things and walk until it burns. Looking to lose fat? Pick up heavy things and walk until you're cooked. Regardless of your goals, weighted carries can help. For muscle growth, the secret is using carries to increase time under tension. 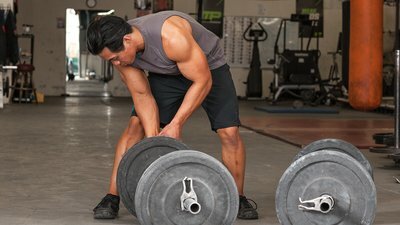 You may have heard that to maximally stimulate muscle growth, you need to include adequate amounts of muscle damage, metabolic stress, and mechanical tension in your training.1 Weighted carries hone in on the latter two, because carrying heavy objects generates a lot of tension and metabolite accumulation. Add carries between sets. Because the goal is to maximize time under tension, use a weight you can carry for at least 45-60 seconds. Aim for 4-5 minutes of total time under tension your first week. Each week, increase the weight, total time, or both. Adding carries into your muscle-building program is simple. Instead of picking up your phone between sets, grab some weights. If your grip strength starts failing, consider using a less grip-taxing version, such as the waiter's carry or Zercher barbell carry. For a muscle-building bonus, hold your arms at a 20-degree angle away from your body. This will torch the deltoids and core and further layer on the muscle. You can thank me for the boulder shoulders and six-pack later. Weighted carries are a great addition to any muscle-building program, because they provide significant time under tension for multiple muscles. If you're in the midst of a fat-loss phase, again, look no further than weighted carries. To maximize their effectiveness, consider adding them as a conditioning session on your nonlifting days. Do your usual warm up, grab weights for carries, set a 20-minute timer, pick up the weights, and walk as much as you can before time expires. If you don't have to set the weights down during the 20 minutes, stop using paperweights. You can do the same carry variation throughout the workout, but you'll probably be able to get more work done if you rotate between overhead, front hold, and farmer carries. In each case, select a weight you can carry for 20-30 seconds at a time. When your form breaks down or your grip starts to fail, set the weight down, recover, shake it out, and dive right back in. Rest as much as you have to, but only as much as you need. Add a fat-burning finisher to the end of any style of workout by repeating the same format, but for 10 minutes rather than 20. Stand tall, hold your form, and you really can't go wrong. Just keep calm and weighted carry on! Schoenfeld, B. J. (2010). The Mechanisms of Muscle Hypertrophy and Their Application to Resistance Training. Journal of Strength and Conditioning Research, 24(10), 2857-2872.